Attention readers, read this review of Match Defense: Toy Soldiers in conjunction with our review of Toy Soldiers for Xbox Live Arcade, because the two games connect. And that's the main selling point for this here free Facebook game. Playing Xbox 360 Without Playing Xbox 360: As I reported earlier this week, people who play the gem-matching game reviewed here are contributing points totals to a virtual World War I that links Facebook and Xbox 360 gamers. The people playing XBLA's Toy Soldiers game — a very different style of real-time strategy game — are contributing points as well, all tabulated on a map of Europe that shows which countries are being taken by which of the two major player factions over the course of wars that last about a week. This aspect of Match Defense is a winner. I enjoyed racking up points through Facebook during lunch time, knowing that somewhere, 360 players were doing the same. I wish the game had provided more feedback about how many points in the battle for each country were being contributed by 360 or Facebook players, because while the games are connected they don't yet feel like connected experiences. Nevertheless, this is an exciting first step toward goofing off at work with a game that relates to stuff we have on our 360s back home. Smooth-Running And DS-ish: At a glance, Match Defense looks like a Bejeweled clone. Technically, it plays as well as any of them, running on Facebook through Microsoft's Silverlight application with a torrent of animating gems, score alerts, multiplier icons and a battlefield of military forces. Gems are matched in the lower pane of the game in order to fire either vertically-aligned or horizontally-aligned shots to the top part of the screen. Up there, enemies advance down to the player in lanes. 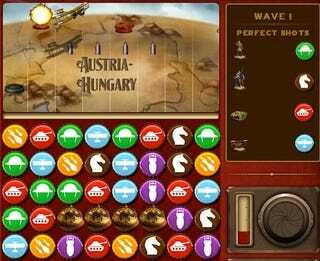 The enemies may be cavalry, tanks or planes, requiring the player to strategize and determine which gems — representing different types of armaments — are best used to counter them. On paper it's good, but in execution it's all so blindingly brisk and tolerant of random clicking, that it doesn't feel like it punishes poor players. It simply rewards better ones with higher scores. It's a frenetic amusement, a pleasantly quick-twitch game for Facebook, though you'll wonder if you're a little too good at it. Maybe that's a bad thing. Maybe it's a good thing. But I'd Rather Be Playing Toy Soldiers: The ease of the game will be friendly to the moms who can help their sons out by playing this game on Facebook while the sons play Toy Soldiers. But that ease also affirms that this game is more of a pleasant diversion than one of convincing and arresting depth. Fun, but not a breakthrough. Having played both this and Toy Soldiers, the connectivity of the game reminds me that I'd rather be home playing Toy Soldiers. Match Defense Toy Soldiers may not be the best video game released this week, but it could prove to be the most important one. If, in the future, we are playing Halo Facebook games that make our Halo console-playing better — or if someone out there is playing Halo Facebook games that make the guns we use on our Xbox 360 Halo games better, or if those Facebook games shape our items in a role-playing game or whatever — then we'll be able to look back at this as a successful experiment. As a game, it's fine. As a hint of what could come next, it's exciting. Match Defense Toy Soldiers was developed and published by Microsoft Game Studios on Facebook on February 12. Retails for $0 USD. Was helping the Allies take Portugal right before I wrote this review. I hope we hold it.